Good On Ya, Ariane 5! Nice job by Arianespace for Measat and Optus. Glad to see something positive happen for Malaysia’s aerospace endeavors. 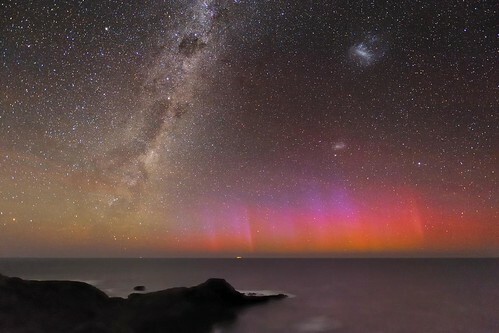 After chasing it for more than two years I was finally rewarded with two displays of Auroa Australis (Southern lights) within a week visible from Mornington peninsula, not far from Melbourne. The nights were warm an clear and the Moon was not in the sky either – I could not have asked for better conditions. Australia’s government on Monday ruled out awarding a contract to broadcast local television into Asia to a consortium including Rupert Murdoch’s part-owned Sky News, deciding the service would stay with the state broadcaster. After two cancelled bids and a police investigation into leaks, as well as political controversy swirling over the reach of News Corp media in Australia, the government said the A$223 million ($230 million) Australia Network tender would be abandoned and Australian Broadcasting Corp would keep it permanently. ‘The government believes it is unfortunate that this process did not reach a satisfactory solution, however, in light of the circumstances it is now in the national interest to make a clear decision about the future of the service,’ Communications Minister Stephen Conroy said in a statement. The Australia Network is Australia’s equivalent of the UK’s BBC World Service and Germany’s Deutsche Welle. The government had already ordered a police investigation into leaks behind news reports that an independent panel set up to decide the tender had unanimously backed Sky over the incumbent ABC after the government reopened the tender and imposed a new ‘national interest’ test. Controversy over the process coincided with the phone-hacking scandal sweeping over the Australian-born Murdoch’s News Corp empire in Britain and a row with Australia’s Labor government over alleged political bias in reporting. Conroy has been critical of News Corp’s Australian arm, News Ltd, accusing it of biased treatment targeting the government. News Ltd, which denied the allegations, controls 70 percent of Australia’s newspaper readership market. After a meeting with senior Cabinet colleagues on Monday, Conroy said that the leaks had compromised the tender process and prevented a fair consideration of the bids. It was unclear if Sky News Australia would challenge the decision. Sky News Australia is a 24-hour cable and satellite news channel, with Murdoch owning a third through his stake in BSkyB, along with Australia’s Seven West Media Ltd. and the private equity-owned Nine Entertainment Co. ($1 = 0.9745 Australian dollars). The Australia Network can found on a number of satellites.